When it comes to marketing a political campaign, we offer a large selection of print products to help make any campaign a successful one. Pass along your message quickly and easily with these traditional campaign printing products. What are political mailers? They are cost effective print products that promote political candidates, campaigns, and beliefs. One mailer that can truly highlight a candidate can be done by EDDM®. Including Every Door Direct Mail® postcards or Direct Mail postcards into a campaign can be beneficial and cost-effective. EDDM® is cost-effective because there’s no need to purchase a mailing list and no postage permit required, making room to use additional campaign money on additional marketing tools. With EDDM®, a candidate can easily market to a specific neighborhood or ZIP code(s) without the use of individuals names or addresses and chooses its audience based on specific mailing routes. EDDM® offers a better response rate than traditional mailings since there’s no need to open an envelope, and they stand out easily among other pieces of mail. Getting the most exposure and reaching potential voters is essential in running a successful campaign. Our talented designers can put together an effective mail piece that is sure to grab voters attention. Design tip: Use large images and include well thought out content; this can help make them hard to ignore. Direct Mail postcards, it allows you to reach existing or new customers by using a mailing list. You’ll be able to target demographics including age, income, voter registration and more. 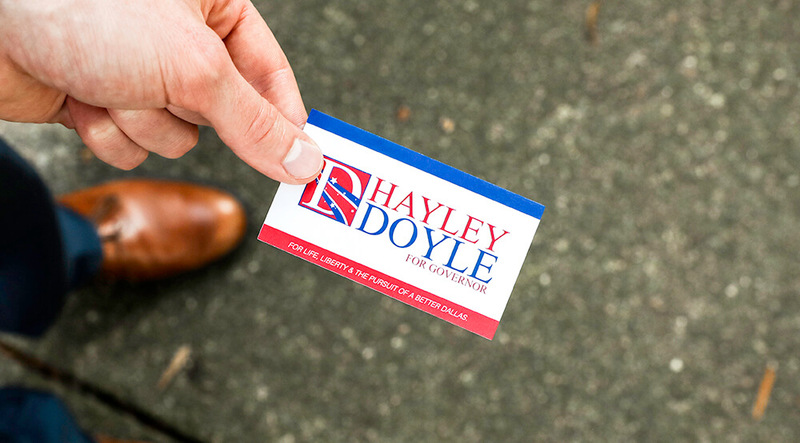 Printing campaign flyers and brochures are beneficial and can be the first and last time a candidate can reach potential voters. When designing either of these, use the candidate’s picture at least once, including a short bio and information regarding previous accomplishments as well as a short, to-the-point description of political stance. A brochure offers a large canvas to include information but try to keep one idea per paragraph and use short sentences and bullets points when needed to help free up white space. A simple, yet creative design can help your brochure get noticed. You can also include separate sections that focus on different topics, including about the candidate, issues, past experience and voting information. Keep the layout simple and clean. Make sure the colors used match the other campaign materials; stickers, flyers, campaign signs, door hangers, etc. 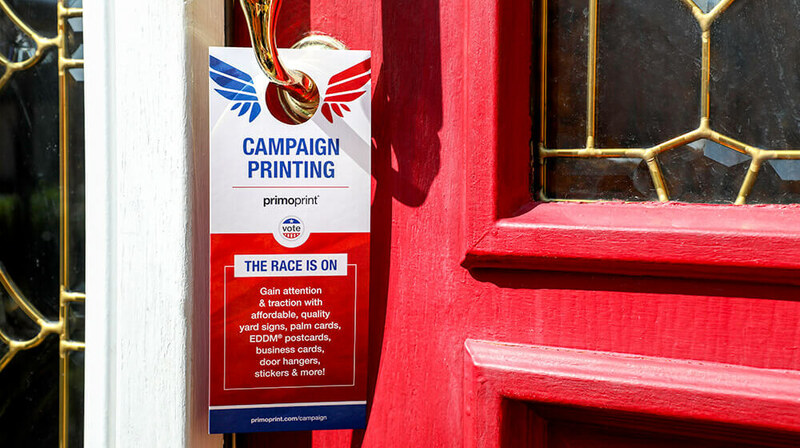 Whether you are running for governor, mayor or sheriff, door hangers are the perfect marketing tool for any campaign. Political door hangers can be easily distributed door-to-door by volunteers to help voters learn more about a candidate, their beliefs, and important voting information. When placed on a doorknob, they are practically impossible to ignore, and residents are likely to read them. Similar to designing a brochure, include colors that not only grab the attention of homeowners but are similar colors used throughout the campaign. Include images that voters can identify with, and make sure the text is easy to read and understand. We offer four different sizes and a variety of finishes, including Glossy UV and Uncoated, to make any door hanger a successful marketing tool. Our full color, single or double sided custom yard signs, made from rigid coroplast (4mm or 10mm) with available H-stake stands, are sure to grab voters’ attention. They are sturdy and weatherproof, making them a great marketing tool year round, generating exposure and support to win an election. These signs are perfect for supporters to easily place in their yard to publicly demonstrate their support. Use political yard signs to display the candidate’s name, district, and website. Keep in mind, cities and counties have their own rules regarding signs, including the placement of them. Need help with a custom design? Our experienced graphic designers will be happy to help. Our coroplast signs are available in four different dimensions and are offered in custom dimensions. For a custom dimension, please complete our custom order form. The design needs to be simple and easy to read. They should include an email address, office phone number, and a photo of the candidate or campaign logo. We offer a wide variety of paper stock and printing options including Silk Laminated, Spot UV, Velvet Laminated, Matte, Inline Foil, uncoated and more. Not sure which style is best for a campaign? Request a free sample packet that features a variety of card stocks and finishes. Turn heads and make a strong impression with our Painted Edge Business Cards. They are 32PT think! Majority of political campaigns include postcards into their marketing strategy because they work. Postcards are cost-effective and are easy to print and hand out. Offered in a variety of sizes, they offer plenty of landscape to include a campaign logo, tagline, social media profiles, and content regarding the campaign message. As you can see, there are plenty of products that can help promote and generate new voters for any type of campaign. Looking for a one-of-a-kind design? We can help! Just complete our online form and one of our designers will be in touch with you.